Gluten Free Pumpkin Muffins. Do you like pumpkin? We eat it all year round. My husband likes to take muffins to work and I usually make these muffins, but I only had a small amount of oat flour. So I decided to tweak the recipe a bit and make these Healthy Pumpkin Muffins. 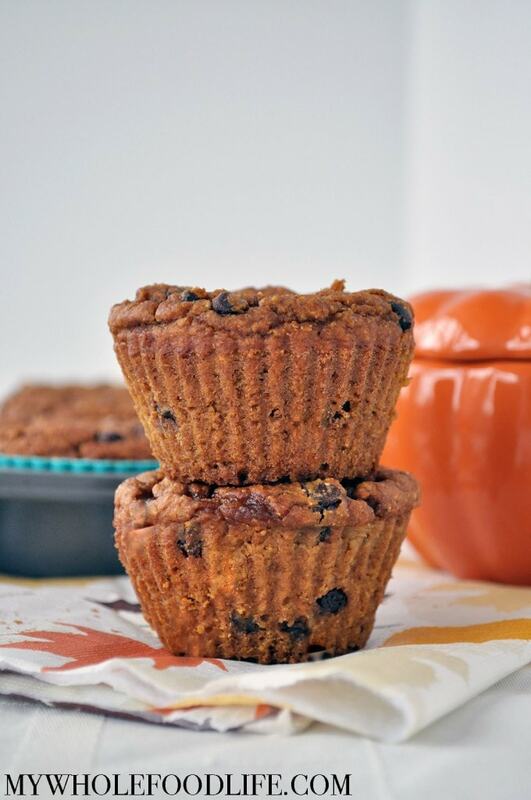 Not only are these healthy pumpkin muffins gluten free, but they also come with an extra boost of protein and fiber! I used 1 1/2 cups chickpea flour to make up for the oat flour I didn’t have. Did you know that 1 1/2 cups chickpea flour contains about 31 grams of protein and 15 grams of fiber? You can read the complete nutritional facts in this source. It worked as a great replacement! In one bowl , add all the dry ingredients. Mix the wet in another bowl . Fold in the chips or raisins if you use them. Use a large cookie scoop to spoon batter into lined muffin pans . Bake for about 12-14 minutes, OR until a toothpick comes out clean. Let cool completely before removing from the baking pan and storing. Keep these stored in the fridge. They should last 2 weeks that way and also up to 6 months if frozen. Enjoy! Hi Barb! I don't see a box on my end. Are you on a phone or computer? The measurement for the maple syrup is 1/3 cup. This sounds good, but is there different oil I can use besides coconut oil, I'm allergic to it. I'm not sure of another oil that will work since it needs to be an oil that can solidify. You may be able to use a few extra cashews in place of the oil, but the cheesecake may not firm up as nicely. I would have never thought to use chickpea flour in muffins!!! I can't wait to try it! Thank you for this recipe! I have some chickpea flour I've been wanting to try and this will be perfect! You are welcome Kim! I hope you enjoy it!